These slow cooker BBQ meatballs are so easy to make and they’re true comfort food. They are perfect to eat on their own or on sliders! The honest truth is that I’ve never been much of a football (or any other sports) watcher, though in the last few something has snapped and Philip started watching college games on Saturdays and NFL on Sundays, so I’ve actually gotten sucked in (a little) and actually learned a little bit about the game. I now actually find it interesting and even know to some degree what’s going on. I don’t even know who I am anymore. Still, I don’t follow any particular team and I have no clue if we even watched any games where the teams playing for the elusive ring tomorrow evening were playing. I’m sure we’ll watch the game, at least in part, but it will be on our couch because apparently we’re not cool enough to get invited to anyone’s party, and even if we did…..we probably wouldn’t go (which, now that I think about it, is probably why no one invites us to their party). Regardless of which team you are pulling for, there’s one thing that everyone can agree on: tail gate food is almost as important as the game itself. You need finger food…food that can be eaten without much attention to how you eat it. Nothing that has to be cut, nothing that takes a lot of effort. You’ve got to keep your eyes on the game. Meatballs fit the bill. I’m sure that lots and lots of frozen meatballs in bags were sold this past weekend….but if you, like me, would rather not buy meatballs in a bag, this recipe, adapted from The Pioneer Woman, is perfect for you. 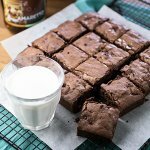 You could bake these instead of putting them in the slow cooker (just half the ingredients for the sauce and bake everything in a baking dish at 350 degrees for 45 minutes), but why would you want to do that? These slow cooker BBQ meatballs are great on their own, but we stacked them on dinner rolls and topped them with super-sharp cheddar (by the way, they’re also wonderful with egg noodles or mashed potatoes!). 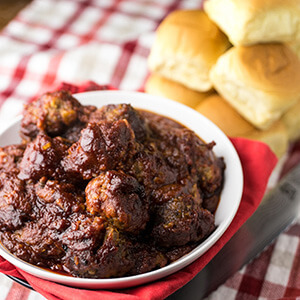 You should serve these slow cooker BBQ meatballs at your next tail gate party! This recipe is adapted from The Pioneer Woman . Combine the ground beef, oats, milk, salt, and pepper in a large bowl. I use my hands to do this. Mix till just combined-don't overmix or your meatballs will be tough! Use a tablespoon or a tablespoon-sized scoop to measure out portions of the meatball mixture, then carefully roll into balls. Fill the bottom of a 10-12 inch skillet with canola oil and heat over medium until a little bit of flour dropped into the pan sizzles. Roll the meatballs in the flour and brown on all sides (it helps to do this in two or three batches so you don't crowd the pan, which will bring down the temperature of the oil), then remove to a plate lined with paper towels to drain. Combine the ketchup, sugar/sucanat, Worcestershire sauce, vinegar, and minced onion in a medium bowl. Pour 1/3 of the sauce into the bottom of a 4-quart slow cooker. Stack the meatballs into the slow cooker, then cover with the remaining sauce. Cook on low for 8 hours or high for 4 hours (I usually cook them on high). Serve by themselves, with egg noodles or mashed potatoes, or on slider rolls (which is what I did!). Yummy... now I'm craving meatballs instead of the chili that's on the stove!